Eighteen years ago an office block, 50 Cannon St. London, had a reception area that had been designed to look like a piece of Mexican desert, sand and pebbles coupled with a large cactus mixed in with other Mexican themed objects. It was so unbelievably naïf particularly being in the middle of the city who knows what the designers were thinking of? The two proprietors of the AIR Gallery, Mayfair, (no longer trading) who happened to represent the work of the artist Adrian Hemming. Cutting a long story short the desert was swept away and three paintings by Hemming, derived from landscape, were installed to be admired by all that visited the offices in the building. All went well for a decade or more until the building was sold yet again. The paintings were removed and stored whilst the decorators got on with their job but alas, alack, someone forgot and the paintings lay in the dark, in the forgotten store room for over five long years. Then the building changed hands once more. The CEO. Chris Kenny of the company that had now purchased 50 Cannon Street was told by some people cleaning out, ready for refurbishment, that they had found some paintings and would he want to view them before chucking out all the rubbish. Well he did and loved them to the extent that the large Diptych “Fluvial Gradients” now hangs in the Boardroom of his company MDDUS, in the London offices, the other two now hang in their Glasgow headquarters. What an amazing near miss! Three valuable paintings almost thrown away with the rubbish have now been resurrected and are once more on view and being admired. Well done Chris Kenny. 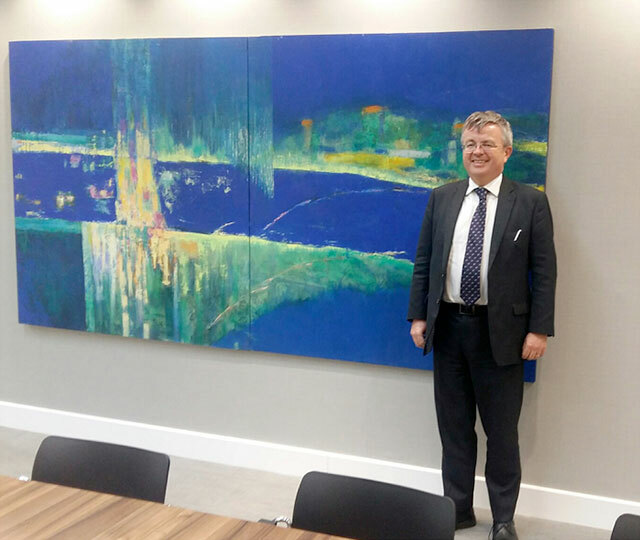 Chris Kenny CEO, standing in front of Fluvial Gradients which is handing in the boardroom of MDDUS, London. 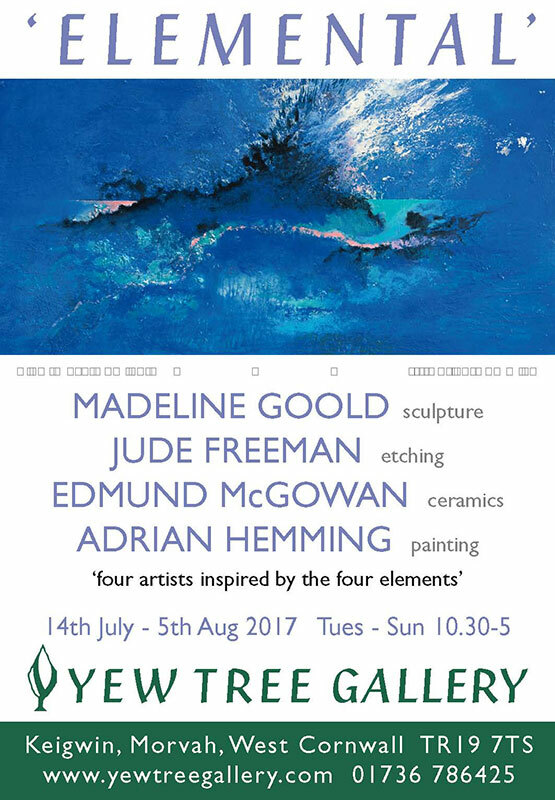 Very excited about my first exhibition in Cornwall, particularly as it’s like family. I have known these artists forever, so its lovely to be united and to see how we have all developed our particular obsessions and styles of work. There will be more information to follow.